Assam-based ERC Eye Care has opened its first hub hospital in Sivasagar on February 6, 2015. Using its award-winning eye care products and services, ERC plans to provide basic eye care to the underserved people in the district and neighboring areas. According to the World Health Organization, 18.8% of Indians suffering from cataracts belong to the state of Assam. Founded by Guwahati based ophthalmologist, Dr. Parveez Ubed, ERC provides affordable, quality eye care to under-served communities in North East India through a hub and spoke model with vision centers, satellite clinics and a hub hospital. ERC also offers primary medical services such as optical retail, pharmacy and consultation. Operations at the new facility in Sivasagar will be led by Dr. Dulon Deka, who was previously working with Guwahati Medical College and Mr. Ranjib Baruah, who will oversee the administrative processes. “ERC, with its diverse portfolio of eye care services, is backed by a passionate team and will impart a huge social impact in Assam where limited healthcare infrastructure, especially for eye care, exists,” added Mr. Scheuch. Despite the fact that more than 40% of the population in the North- East has eye problems, most people travel several kilometers for a proper diagnosis or to procure glasses at high costs or get cataract surgeries. 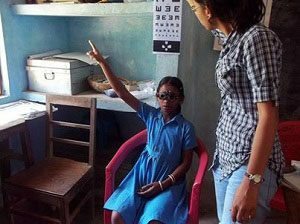 With rural centers across various subdivisions, ERC Eye Care has grown to provide services to at least 33,000 people in rural areas of Assam and Nagaland. ERC Eye Care is now recognized as a prominent social venture who has undertaken significant efforts towards primary eye care. Along with being a finalist at the Fast5 Challenge in Netherlands, ERC has received awards at Mahindra Spark the Rise, Eureka- IIT Bombay, Tata Challenge- IIM Kolkata, Sankalp Awards and the Make a Difference Fellowship. Along with the launch of the new hospital in Sivasagar, ERC Eye Care also announced a joint initiative with NVG 2.5 – a division of the world’s leading manufacturer of eye care products ESSILOR – to provide best quality, affordable glasses to the people of North-East India. ERC has plans to expand throughout the region within the next few years, carrying with it its motto of affordable, accessible and inclusive eye care to the Base of the Pyramid. The Ennovent Circle is an exclusive group that collaborates to place capital in high potential innovations in low-income markets. To secure capital for your enterprise, write to Joel Rodrigues.